Oh, Porsche 911. We'd take you home with us any night. As much as we love the practicality and ruggedness of trucks and SUVs, our heartstrings get plucked by potent sports cars and muscle cars. Who can blame us for traveling back to our childhood passions starting from our love of Hotwheels and LEGOs. At this year's Chicago Auto Show, there was no shortage of racy and muscled cars to get our petrol blood flowing. Here are some shots of the best ones from the show that begins this weekend at Chicago's McCormick Place. What more can we say about the GT500 than the monstrous 700+ horsepower that's dished out by the 5.2-liter supercharged V8? Well, now that the live rear axle is gone, this thing should do straight lines and curves better than just about anything in its class. Oh, and it's NOT for Chicago winters. The R8 is still very much alive, and one of the world's most livable supercars is even better with the top down to hear its sonorous V10 engine with 532 horsepower. The matte white paint will also match the color of your knuckles as you hammer the throttle on this all-wheel drive exotic. The Camaro is no longer just a straight line machine for drag racing. It's evolved into a curve carver of the best kind, and it gets a reworked fascia for 2019 that's sleeker and more menacing. The SS gets 455 horses from its big 6.2-liter V8 engine. That matte black hood also cuts down on glare. How kind of them. Damn the reliability. The Giulia Quadrifoglio is the best sports sedan we've driven in recent memory. The turbocharged 505 horsepower V6 is more than willing, and the interior is daily usable. If you want to stand apart from the Germans in a really big way, this is how you do it. The track version of the already fast RC F gets faster thanks to weight loss and a bump in power to 472 from its naturally-aspirated V8. It drops 176 pounds thanks to lighter BBS wheels, carbon ceramic brake rotors, and titanium exhaust components, just to name a few. Did we mention it looks mean as hell? The TT RS is the bargain supercar we long for thanks to its rapier-like steering precision, all-wheel drive traction, and a blazing-fast 3.4-second 0-60 time from a unique five-cylinder engine. Add the adaptive suspension, and you have a track-capable car for less than $70K that can run with exotics. Call the Charger Scatpack with its huge 485 horsepower 6.4-liter HEMI V8 a civilized monster because it looks almost sophisticated with its slick lines that outline a muscular body. Mash the throttle, and have your organs resituated and your face pulled back better than Botox. And bring the kids because it can fit the kids, too. Barf bags required. See above but lose two doors. Yes, the Challenger lives on with the same old-school ethos but powered with Street Racing and Technology in the name with the same 485 horsepower HEMI V8 as the Charger. The new Supra made its debut in the Windy City, and it looks as good in person as it does in photos. The 335 horsepower from its turbocharged V6 and track-focused suspension and steering should make it a hoot on commutes, as well as the track. We're thrilled that the nameplate is back, and its BMW counterpart, the Z4 should be just as good, if not better, to drive. How do you improve on a legend? Well, tweak the exterior for more visual drama (just look at those new full-width taillights and the engine vent!). 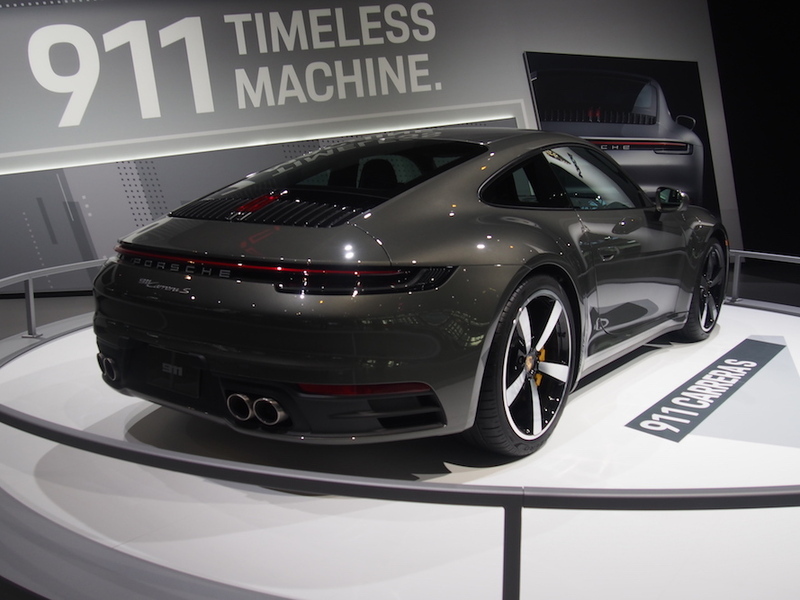 Then, give the new 992 versions a 3.0-liter turbocharged flat-six engine with 443 horsepower (23 more than the last car). Look at 0-60 times around 3.5 seconds. Enough to make you consider track school (as you well should). Kia is trying to kick its economy car ethos, and it's working. The Kia Stinger GT is a no-compromise sports sedan that looks good and drives even better. Its 3.3-liter turbocharged V6 is good for 365 horsepower, and you can get all-wheel drive with it for winter sure-footedness without worry. Oh, did we mention its a spacious hatchback? Yep. We'd call the Miata subtle on drama, even though in RF trim the retractable roof is downright mesmerizing. Now clad the capable roadster in orange, and you have yourself a recipe that draws the eye like no other Miata that came before it. Black wheels, Recaro sport seats, and 30th Anniversary Edition badging just make it that much more attractive. Only 3,000 will be made worldwide. The WRX STI keeps soldiering on with the same capable turbocharged 2.5-liter flat four-cylinder engine, but in the S209, things get a bit madder. Not only does it get the first real power bump in ages (341 compared to 310 in the WRX STI RA), it also gets a special water spray that keeps the intercooler cool, a wider body, upgraded suspension, and special wheels and tires. Don't call Godzilla old because it's still one of the most remarkable sports cars available today. Its 3.8-liter twin-turbo V6 provides a whopping 565 hp mated to a dual-clutch automatic transmission and all-wheel drive. 0-60 comes in 2.9 seconds. What??!! Then there's the top-trim NiSMO with 600 horses. It really is the Japanese Ferrari with unique looks, to boot. So, the ATS sedan is dead. So what? We still get the coupe, and the V version is an absolute nut that's posh inside and good enough for track duty. The twin-turbo 3.6-liter V6 will throw down 464 horsepower like a madman, doing 60 mph in 3.8 seconds. Folks, that's faster than a BMW M4. Be glad this thing still exists because it's one of the best American performance cars alive. The 718 Cayman gives up practically nothing to its 911 brother. The fact that its engine is mid-mounted gives it better balance. Don't laugh at its four-cylinder engine that's down two cans from the previous generation. The engine makes 25 hp more than the previous-generation Cayman GTS’s naturally aspirated 3.4-liter flat six, and the power is on demand and unrelenting.